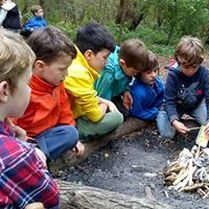 Our Holiday Bushcraft Clubs run from 8.30am to 4pm and are designed for children​ aged 5-12. They are run by experienced qualified teachers who will inspire children and share their knowledge and skills of surviving in the wild. The sessions focus on practical bushcraft and survival skills and introduce a range of tools, used with assistance and under close supervision. 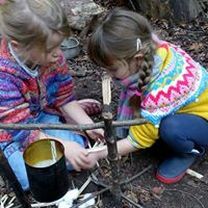 Following the forest school approach, they provide opportunities to undertake activities cooperatively in groups to strengthen social development and problem solving skills. Team-building activities will be both physical and intellectual and promote communication skills and language development. Children will be encouraged to set their own challenges and take acceptable risks to build their self confidence and sense of achievement. ​The cost for each day is £38 per child. Children need to bring a packed lunch and large water bottle (which can be refilled throughout the day) and dress for the weather. Please send children with a change of clothes and ensure they wear suitable footwear, preferably closed toe shoes such as hiking boots, wellies or trainers. We will take care of everything else including providing all specialist equipment with delicious snacks cooked on the fire!